You are here: Home / Company Law / The truth behind offshore companies, legal or illegal? 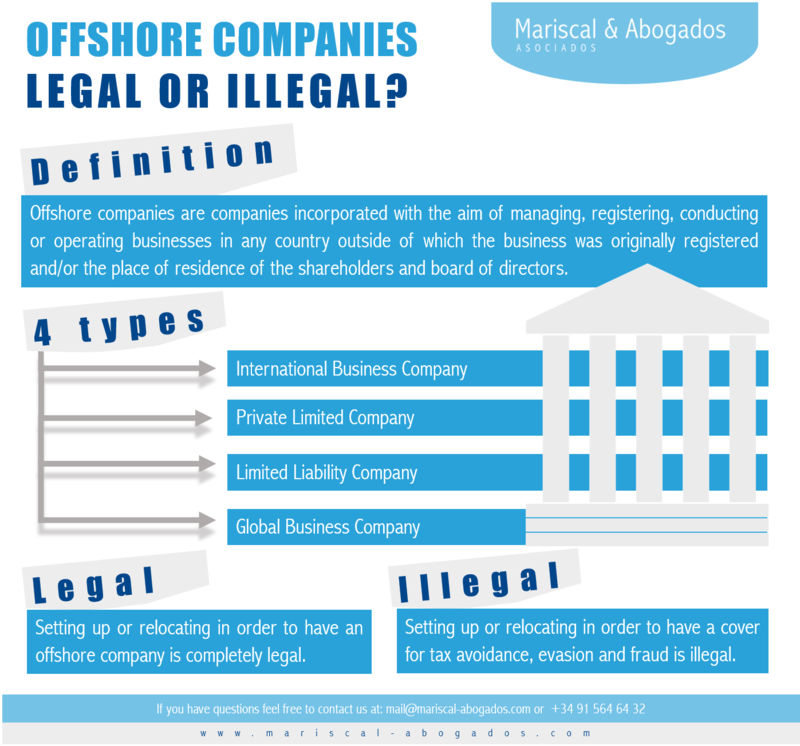 The truth behind offshore companies, legal or illegal? Offshore Companies are incorporated with the aim of managing, registering, conducting or operating businesses in foreign countries (any country outside of which the business was originally registered and/or the place of residence of the shareholders and board of directors). They are typically set up for financial, legal and tax benefits. If a company sets up or relocates to a foreign country, they may enter into contracts, open bank accounts, own, purchase and sell property, which is essentially the same as any other company. Many individuals and corporations who use offshore companies do so in order to reduce taxes, manage risk, maintain privacy, protect/enhance assets and/or reduce costs. Companies incorporated in “tax haven” countries offer individuals and businesses little or no tax liability, meaning they do not have to pay the high taxes in their home country (unless they are also carrying out business activity in the home country). There are four basic types of offshore companies that can be set up: International Business Company, Private Limited Company, Limited Liability Company and Global Business Company. The best place to set up one of these type of companies depends completely on the goals of the company. Larger, more diverse companies may benefit more from going to Hong Kong or Singapore where they will pay a small amount of taxes, but gain access to more financial opportunities and banking. A smaller company might want to set up in a country with no accounting requirements and zero taxes. Even though setting up or relocating in order to have an offshore company is completely legal, it is often a cover for tax avoidance, evasion and fraud. The Parliamentary Assembly of the Council of Europe has recently stated that: Council of Europe member States lose billions every year due to tax avoidance, tax evasion and tax fraud that are facilitated by the offshore financial system including tax havens and secrecy jurisdictions. This massive tax cheating by wealthy individuals and enterprises not only penalizes ordinary tax payers, public finances and social spending, but also threatens good governance, macroeconomic stability and social cohesion. Offshore companies that benefit from tax havens, whether for tax evasion (illegal) or transfer pricing or other tax avoidance strategies (legal), benefit massively from the countries where they operate (public services, facilities, infrastructure). In return, the tax haven benefits economically as the companies often bring much needed jobs and aid to impoverished countries. However, the use of these tax havens for transfer pricing and tax avoidance has had a negative impact on EU revenues by reducing the gross national income of Member States. Furthermore, the lower tax revenue reduces willingness of Member States to increase or maintain their contributions to the EU. The EU has made efforts to crackdown on companies that are trying to avoid paying taxes. The EU published a list of international tax havens in June 2015, which included Hong Kong, Brunei, Cayman Islands, British Virgin Islands and Panama. According to a draft of the Anti-Tax Avoidance Directive, the EU is targeting taxpayers that act against the actual purpose of the law, taking advantage of disparities between national tax systems, to reduce their tax bill. The European Commission recently stated that they are putting together measures to block the most common tax avoidance methods, recommendations to member states on how to prevent tax treaty abuse, proposals for member states to share tax-related information on multinationals in the EU and new processes for listing third countries that refuse to play fair. The European Parliament estimates that tax avoidance by multinationals costs European Union Countries around 70 billion euros per year in lost revenues. The EU’s efforts to tackle tax havens are weakened by the fact that some Member States engage in harmful practices. Tax havens have proven difficult to influence and there is a general lack of commitment not only within the EU but also internationally to eliminate these havens, as countries have been historically linked to tax havens. If the EU can influence the behaviour of citizens and businesses that operate within the EU, they can reduce if not remove the harmful effects of tax havens. Europeans and businesses that are playing fair are the ones suffering and paying higher taxes as a result. The billions of euros lost in tax avoidance annually could be spent bettering Member States’ public services, employment and growth. https://www.mariscal-abogados.com/wp-content/uploads/2016/04/33-2016-The-truth-behind-offshore-companies-legal-or-illegal.png 1303 1397 Karl H. Lincke https://www.mariscal-abogados.com/wp-content/uploads/2018/11/Logo-Mariscal-Abogados-Legal-Services-Spain-300x93.jpg Karl H. Lincke2016-04-14 08:00:352016-04-14 12:36:29The truth behind offshore companies, legal or illegal?